(Nov. 29, 2018) -- Nine UTSA degree programs are recognized in the newly released 2019 Times Higher Education World University Rankings by subject. Using the same rigorous methodology as its prestigious Times Higher Education World University Rankings, the subject rankings are based on key performance indicators in five areas: citations, industry income, international outlook, research and teaching. UTSA’s highest program ranking belongs to computer science. Times Higher Education considers UTSA’s computer science program the 60th best in the nation and among the top 250 in the world. The UTSA Department of Computer Science includes nearly 30 faculty members who use cutting edge technology and challenging techniques to prepare UTSA students for this high demanding workforce. It is one of many UTSA programs that contributed to the university’s No. 1 cybersecurity program in the nation ranking according to Ponemon Institute. Other UTSA sciences programs are also getting global attention. As a leader in biological and sports science subjects, UTSA is ranked No. 110 in the U.S. and among the top 600 in the world in the life sciences category. Additionally, UTSA’s physical sciences programs are No. 111 in the U.S. and named among the top 500 in the world. This ranking highlights UTSA’s mathematics and statistics; physics and astronomy; chemistry; geology; and environmental sciences programs. The UTSA College of Sciences prepares the next generation of scientists to take their place in the workforce as well-educated and highly-trained citizen leaders. The College makes significant contributions in species conservation, nanotechnology, brain health, stem cells, medicinal drug discovery, infectious diseases and vaccine development, and cybersecurity. UTSA is also a powerhouse in preparing the educators of tomorrow. The university’s education program is ranked No. 79 in the U.S. and among the top 300 in the world for its leadership in education, teacher training and academic studies in education subjects. This year’s education ranking includes 428 universities from around the world. “This honor is indicative of how the UTSA College of Education and Human Development (COEHD) prepares students to become innovators and leaders in the education field,” said Margo DelliCarpini, dean of the college. “Our college strives to provide high-quality instruction and educational experiences that equip students with the knowledge and skills needed to become world-engaged educators." COEHD is a national and international model in innovative teaching practices, health professional development and binational/bicultural issues. It is the leading source of educators in the San Antonio area, with more than 500 teacher educators completing the teacher certification and professional certification programs each year. The UTSA College of Engineering is also recognized as a world leader in engineering and technology. Times Higher Education ranks UTSA’s engineering programs No. 88 in the U.S. and among the top 400 in the world. UTSA students may choose from five engineering disciplines: biomedical, chemical, civil and environmental, electrical and computer, and mechanical. Each program helps students develop a strong background in the engineering sciences and learn the analysis, design and synthesis tools necessary to be an active participant in traditional as well as new and emerging areas of technology. UTSA is also named among the world’s leaders in arts and humanities. Times Higher Education ranks UTSA No. 94 in the U.S. and among the top 506 in the world for its programs in arts, design, languages, literature, linguistics, history, philosophy, theology, architecture and archaeology, which are all housed in the UTSA College of Liberal and Fine Arts (COLFA). Out of nearly 700 universities from around the world, UTSA is tied for No. 105 in the U.S. and among the top 500 social sciences programs in the world. This ranking highlights universities that are leading across communication and media studies, geography, politics and international studies, and sociology, all part of COLFA. Additionally, UTSA’s most popular major, psychology, is gaining worldwide attention. Times Higher Education ranks UTSA’s psychology subjects 128 in the U.S. and in the top 401 in the world. “These latest strong rankings are further evidence of our faculty’s commitment to research excellence and especially to the UTSA College of Liberal and Fine Arts core strategic focus on cross-cultural communication,” said Dan Gelo, dean of COLFA. 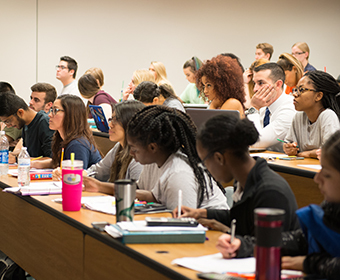 One of UTSA’s most academically diverse colleges and its largest with nearly 7,100 students in 11 departments, COLFA contributes to the education of virtually every UTSA student through its highly ranked core curriculum. UTSA is also among the top 120 in the U.S. and 501 universities worldwide ranked for excellence in business and economic programs. The university is recognized for being a leader across business and management, accounting and finance, and economics and econometrics subjects. The UTSA College of Business delivers unparalleled value through educational programs that supply students with technical and professional skills that can be implemented immediately in the workplace in high-demand fields. With more than 6,500 students, the college offers a comprehensive curriculum at the undergraduate, master’s and doctoral levels and offers unique programming in cybersecurity, data analytics, entrepreneurship, financial services, and real estate finance and development. In each of Times Higher Education’s subject rankings, UTSA scored particularly high in the citations category, which measures research influence by examining the number of times a university's published research was cited by scholars around the world. UTSA also measured strongly in industry income for the commercial impact of its research. Earlier this year, Times Higher Education ranked 1,250 universities in its World University Ranking. UTSA ranked among the top 600. Learn more about the Times Higher Education World University Rankings by subject. Expand your horizons with a UTSA degree.